Congrats to the chapter for their 2012 award for Best Special Event (mid-sized chapter category) for the Mock Proxy Battle Conference. NIRI is a professional association of corporate officers and investor relations consultants responsible for communications among corporate management, the investing public and the financial community. 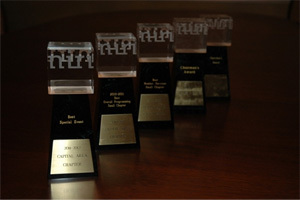 With more than 3,300 members representing over 1,600 publicly held companies and $9 trillion in stock market capitalization, NIRI sets the highest standards in education designed to advance the practice of investor relations and meeting the growing professional development needs of those engaged in the field. Educational seminars: About 21 programs are offered each year, ranging from week-long conferences on investor relations to one-day seminars on specialized topics. Annual conference (each June): General sessions and hands-on break-out sessions on basic and advanced topics for over 1,500 attendees. More than 90 companies exhibit their state-of-the-art products, from wire services to real-time databases to targeted mailing lists. Volunteer Advisory Network: A mentoring network of experienced members who volunteer to give one-on-one advice to new members. Publications: NIRI's two flagship publications are IR Update, a monthly newsletter packed with leading-edge articles, and Investor Relations Quarterly, a quarterly magazine of prescient articles and research. All members receive the Standards of Practice Handbook for Investor Relations, NIRI's membership directory and regular surveys on annual reports, technology, compensation and IR trends. Career Center: Available online to NIRI members only at www.NIRI.org. NIRI has local chapters throughout the United States. The Capital Area Chapter is comprised of investor relations professionals from the Washington, DC metropolitan area. Enrollment is easy and quick. For more information, click here to Contact us and we will send you a new member packet, containing further information about what our organization has to offer. Website Design And Development By Curran & Connors, Inc.